Many of you would be knowing that bitter gourd is a favorite veggie at our home and of course not for me,it is favorite to everyone at my in laws place.This vegetable finds its place at least once in a week and especially during week end lunches.Most of the times I make fry out of it and I even opt for a quick,faster and a low cal version.Oven works best for me for making any of these vegetable fries with out consuming so much oil,it consumes hardly a tsp of oil.My husband can eat bitter gourd fry as a snack as he likes it very much,so most of the fry which I make will go into his plate and I just take a small portion to taste it. Coming to this recipe I had adapted this version from one of my cook book's collection as I found the recipe simple and I know that bitter gourd and onion goes well with each other.The outcome was good and even I enjoyed it having with rice.If you are a bitter gourd lover you will definitely love it and even though if you are not you might start liking it,so better give a try. Chop bitter gourd into small cubes and add turmeric to it and leave it aside for half an hour.Squeeze the bitter gourd pieces and keep them aside. Extract tamarind pulp and dilute with enough water to cook bitter gourd pieces. Boil the thin tamarind water and add salt,turmeric and bitter gourd pieces to it and cook until soft.Strain the pieced and keep them aside. Mean while finely chop the onions and keep them aside. Heat a tsp of oil and and add bengal gram(chana dal),red chillies and fry well.Add dry grated coconut and fry again. At the end add garlic and shallots and fry for a minute and let the mixture cool down a bit.Add little water to it and grind to a smooth paste. 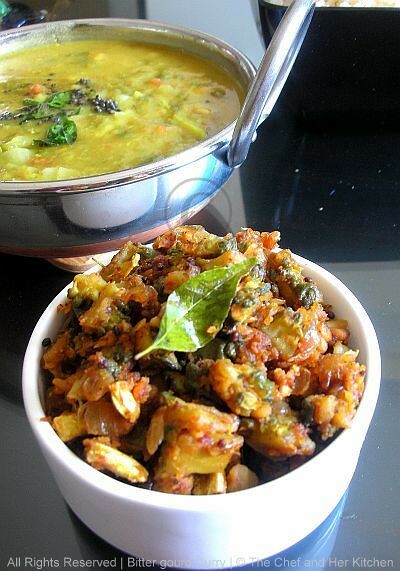 Heat remaining oil in a pan and fry onions until light golden in color.Add curry leaves and cooked bitter gourd pieces and fry on a slow flame until it is slightly crispy and brown in color. Add ground paste,jaggery and salt and fry until the mixture dries up and coats the bitter gourd pieces properly. Serve it hot with hot piping rice,dal,rasam and papad. Wow yummy and healthy curry...Awesome clicks as usual. Not a bitter gourd eating person,still nice recipe prathy! I have a big Chinese bitter gourd in the fridge, your recipe came at the right time. Will try it Prathy! Looks yummy, the photos look classic. Healthy and yummy bittergourd curry. Love love love bitterguard.. so i will surely love this curry..
Woww.. looks simply delicious and perfect.. Thanks for sharing dear !! bitterguard curry looks to attractive and healthy. I am a bitter gourd loving person..loved the presentation and clicks. Never tried cooking bitter gourd this way!!!! looks yummy!!! very yum! the grinding part looks really nice! I add tomato also! 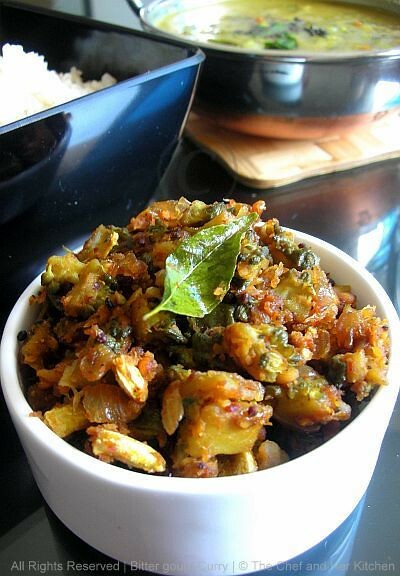 I love karela/bitter gourd and this looks so tempting and delicious..nice recipe..thanks for sharing! Very tempting and I love bitter gourd! Very tempting and delicious !!! I run a km far when i see bitter guard. But u r clicks and presentation looks awesome and want to have it. 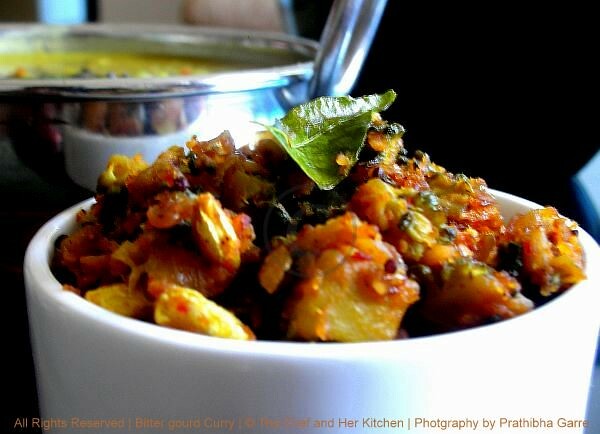 I love bitter gourd and taht's one delicious curry - can't wait to try. Love bitter gourd curry,looks yum yum. Bitter gourd in any form is welcome in our house. this one looks dleicious. very healthy and tasty curry.love it. I've just found your blog and I'm a big fan of your recipes. They all seem so flavourful and delicious! I'm very excited to note some of them down and then cook them for my family! I've just found your blog and I am a big fan of your recipes. They all seem so flavourful and delicious! I'm excited to cook some of them for my family. oh wow my mouth watered! i also bought karela yday. planning to make it stuffed. will post soon. ur versions lookd delish!